Yesterday was the fourth annual National Day of Remembrance to honor the lives of thousands of Americans killed by illegal aliens. Events were held around the country, organized with the help of The Remembrance Project, a growing national organization dedicated to supporting the families of the victims and educating the public about the human cost of failing to enforce immigration laws. 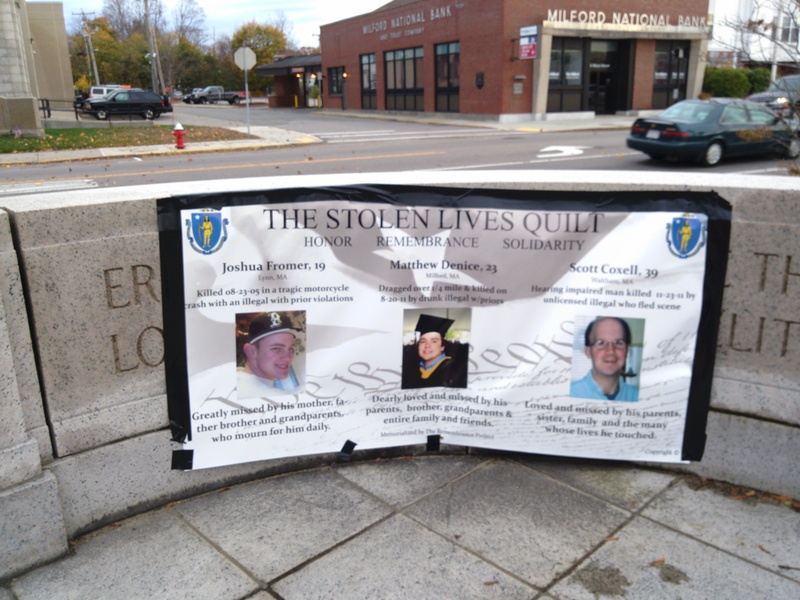 I attended the Massachusetts Day of Remembrance event in Milford, which was organized by the Project's state director, Maureen Maloney, whose son Matthew Denice was killed in August 2011, just a short distance from the park where the ceremony was held. Denice was struck by Luis Guaman, an illegal alien driving drunk and unlicensed in a vehicle illegally provided to him. Denice survived the initial crash, but died after being dragged for a quarter of a mile as Guaman fled the scene. Guaman had at least three prior arrests for unlicensed driving and had served a year of probation after an assault on two peace officers. After years of delays resulting from a judge's order to tutor Guaman in the U.S. criminal justice process, protracted efforts by his attorney to secure an interpreter skilled in an indigenous Ecuadoran language (whose services ultimately were not needed as Guaman finally admitted that he preferred to communicate in Spanish), and the escape of a key witness, also an illegal alien who was released by ICE on an electronic monitoring bracelet despite a prior history of flight, Guaman was convicted of motor vehicle homicide and other charges in May 2014. Maureen Laquerre, whose brother, Richard Grossi, was killed in 2009 just two blocks from the site of the event, also spoke at the gathering. Grossi died of injuries sustained in a crash after illegal visa overstayer Maria Leite ran a stoplight. Leite eventually was sentenced to two years in jail for motor vehicle homicide, but did not serve it because after sentencing she immediately withdrew her guilty plea, and instead accepted deportation to Portugal (as a "non-criminal") before a new hearing could take place. When asked this weekend by a national newscaster if anything has changed in immigration policy since her brother's death, Laquerre replied, "only the death toll." Following remarks about each of the victims honored, Maureen Maloney told those gathered, "As a mother, my greatest fear after losing my son is that we will lose the memories of my son. I don't want him to be remembered just as a poster-person for illegal alien crimes, but more importantly I don't want other families to suffer as we have." Matthew Denice, of Milford, died at age 23 on August 20, 2011. Richard Grossi, of Milford, died at age 55 on October 21, 2009. Joshua Fromer, of Lynn, died at age 19 on August 23, 2005. He was killed in a motorcycle crash with an illegal alien with prior violations. Scott Coxell, of Waltham, died at age 39 on November 23, 2011. He was run over in a crosswalk by a car that police believe was driven by an illegal alien unlicensed driver who fled the scene. She was charged, but later retracted her confession. Her boyfriend claimed responsibility, but escaped prosecution because authorities had no evidence that he was responsible. Sara Escudero, of Stoughton, died at age 64 on June 24, 2013. She was killed while driving to her job as a nurse by an illegal alien visa overstayer who was driving drunk and unlicensed after a night of partying. Ashton Cline-McMurray, of Boston, died at age 16 on October 13, 2000. He was killed by a group of Asian Tiny Rascals gang members, including at least one illegal alien from Cambodia, named Loeun Heng. After Cambodia refused to accept Heng for deportation and ICE had to release him six months later according to the terms of a Supreme Court ruling, the case brought national attention to the problem of court-ordered criminal alien releases, which now number in the thousands, including more than 100 convicted murderers like Heng. The national director of the Remembrance Project, Maria Espinoza, yesterday called on President Obama to direct federal funding for restitution to American families who have lost loved ones to illegal aliens, and other educational efforts. Espinoza said the funding could come from fees paid by illegal aliens getting work permits under the Deferred Action for Childhood Arrivals (DACA) program. "The redistribution of these funds to our victim families, in accordance with an already established formula of victim compensation, will provide hope to all aggrieved American families that their American leader truly understands their plight and that you will, as the First Lady often says, place 'American families first,'" said Espinoza. According to a report submitted to Congress under a requirement in the 2014 appropriations bill, USCIS claims that DACA applicants paid enough in fees to cover the claimed program costs of approximately $280 million from 2012 to 2014. A small increase in fees paid by illegal aliens applying for legalization and work permits, whether through DACA or any planned executive action, would indeed provide a substantial source of funding for illegal alien victim restitution and other programs. Currently, DHS and ICE have no programs in place to aid victims of criminal aliens. ICE's so-called Public Advocate, Andrew Lorenzen-Strait, has told me twice that he intends to devote more effort to this activity, but has produced nothing, instead devoting his considerable staff and resources to helping illegal aliens win release from detention and deportation. ICE claims to operate a Victim Notification system, but has refused to answer my questions about how it is publicized and how many victims have taken advantage of it. I have asked a number of victims' family members if they ever were offered this service, but none have been.